How the Native American fight against the crude oil pipeline unfolded. The tensions between law enforcement and protesters pushing to block the Dakota Access Pipeline heightened this week, as officials moved in to clear out protesters setting up camp on private property. The clash yesterday, which resulted in more than 100 arrests, came after months of demonstrations and an ongoing legal battle waged by the Standing Rock Sioux Tribe and others over the proposed 1,172-mile crude oil pipeline being built by Dakota Access, a subsidiary of the Texas-based company Energy Transfer Partners. Over a thousand protesters are still camped out near the Standing Rock Sioux Tribe's reservation in North Dakota. The push to block this pipeline has become one of the biggest Native American demonstrations in decades. The tribe argues that the pipeline will threaten the reservation's water supply and traverse culturally sacred sites. Energy Transfer CEO Kelcy Warren has said that "concerns about the pipeline’s impact on the local water supply are unfounded" and that "multiple archaeological studies conducted with state historic preservation offices found no sacred items along the route." (Mike McCleary/The Bismarck Tribune via AP) Law enforcement stand in the distance as fire and thick smoke from burning tires billows in the air at a protest roadblock across Highway 1806 at the Front Line Camp in Morton County, North Dakota, Oct. 27, 2016. Dakota Access announced in a statement that it had received permit approval by the North Dakota Public Service Commission, bringing the four-state crude oil pipeline a step closer to construction. Dakota Access wrote on its website that it hopes to have the pipeline in operation by the end of 2016, transporting 470,000 barrels of oil per day from North Dakota to Illinois. Attorneys for the Standing Rock Sioux Tribe took their first legal action to block the pipeline to the courts on this day, officially filing a complaint against the U.S. Army Corps of Engineers over its process for granting permits to Dakota Access for the pipeline. Lawyers for the tribe also pressed charges against Dakota Access, and months of litigation followed. 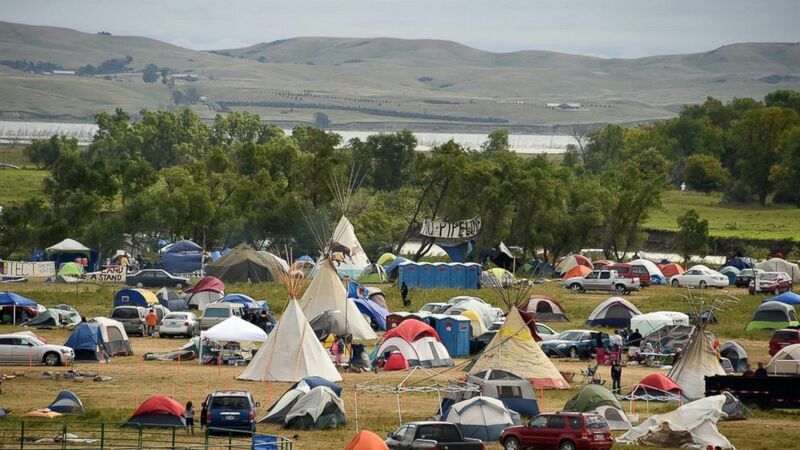 Most of the organized demonstrations and protesting began shortly after the tribe filed the lawsuit, and as the summer waned on activists and native groups from across the country began flocking to a camp set up in North Dakota near the Standing Rock Sioux Tribe's reservation. "For indigenous peoples, the environment is a living entity that contains our life sources as well as our sacred sites and heritage. The environment is an important part of our lives and any threats to it impacts our families, ancestors and future generations. 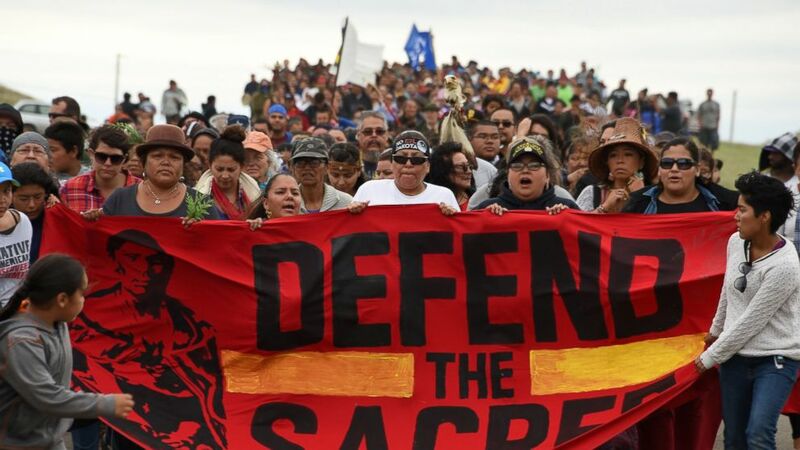 It is therefore imperative that the United States respects and recognizes the intrinsic, inter-related rights of Sioux and their spiritual traditions, history, philosophy, and especially their rights to their lands and territories," the UN group said in a statement. "The world is watching what is happening in North Dakota." Protesters and private security workers hired by Dakota Access clashed on this day. Witnesses say private security workers unleashed pepper spray and pit bulls on a crowd of men, women, and some children who were protesting the pipeline over the weekend. But local authorities say the protesters became aggressive, nearly overwhelming the workers and security at the construction site. 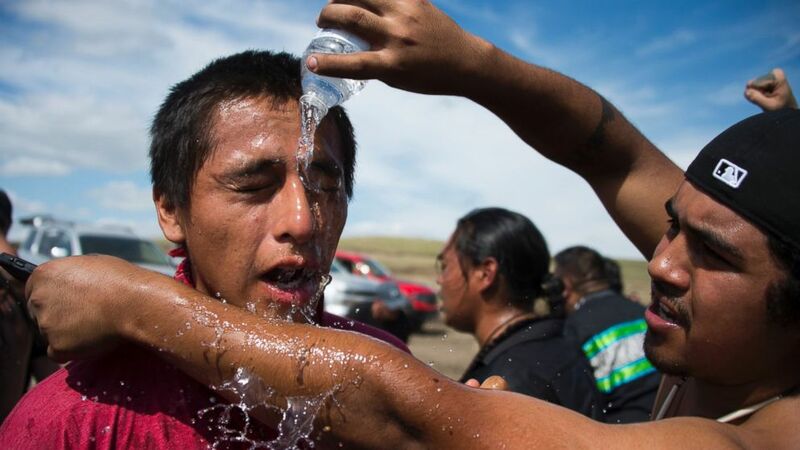 The Morton County Sheriff’s Office told ABC News that three workers were injured by protesters; tribal officials reported that 30 protesters were hit with pepper spray and 12 more were bitten by dogs. A federal judge denied the Standing Rock Sioux Tribe's request for a temporary injunction but appeared sympathetic toward the tribe's plight in his ruling. "Aware of the indignities visited upon the tribe over the last centuries, the court scrutinizes the permitting process here with particular care," Federal Judge James Boasberg of the U.S. District Court in Washington, D.C., wrote. "Having done so, the court must nonetheless conclude that the tribe has not demonstrated that an injunction is warranted here," Boasberg added. The same day, however, three federal agencies intervened in an unprecedented manner, requesting that the pipeline company voluntarily halt construction of the pipeline near Lake Oahe. In a joint statement, the Department of Justice, Department of the Interior and Department of the Army said: "The Army will not authorize constructing the Dakota Access pipeline on U.S. Army Corps of Engineers land bordering or under Lake Oahe until it can determine whether it will need to reconsider any of its previous decisions regarding the Lake Oahe site under the National Environmental Policy Act (NEPA) or other federal laws. Therefore, construction of the pipeline on Army Corps land bordering or under Lake Oahe will not go forward at this time. The Army will move expeditiously to make this determination, as everyone involved — including the pipeline company and its workers — deserves a clear and timely resolution. In the interim, we request that the pipeline company voluntarily pause all construction activity within 20 miles east or west of Lake Oahe." (Robyn Beck/AFP/Getty Images) The Missouri River is seen beyond an encampment Sept. 4, 2016, near Cannon Ball, North Dakota where hundreds of people have gathered to join the Standing Rock Sioux Tribe's protest of the Dakota Access Pipeline (DAPL). President Obama weighed in on the growing movement to block the pipeline, and hosted more than 500 Native American leaders for his eighth and final White House Tribal Nations Conference as president. In the evening hours the day before Columbus Day, a federal holiday many indigenous people find offensive, a federal appeals court denied the tribe's appeal of the Sept. 9 ruling. “The Standing Rock Sioux Tribe is not backing down from this fight,” Chairman Dave Archambault II said in a statement following the appeals court ruling. “We are guided by prayer, and we will continue to fight for our people. We will not rest until our lands, people, waters and sacred places are permanently protected from this destructive pipeline." (Robyn Beck/AFP/Getty Images) Native Americans march to a burial ground sacred site that was disturbed by bulldozers building the Dakota Access Pipeline (DAPL), Sept. 4, 2016 near Cannon Ball, North Dakota. Actress Shailene Woodley was arrested while protesting the pipeline in North Dakota. Woodley broadcast video of her entire arrest on Facebook Live. She later pleaded not guilty to criminal trespass and riot charges. (Morton County Sheriff's Department via REUTERS) Actress Shailene Woodley is seen in this booking photo released by Morton County Sheriff's Department in North Dakota,on October 11, 2016. Citing the “militarization” of local law enforcement, tribal leaders called on U.S. Attorney General Loretta Lynch to investigate civil rights violations. A spokesperson for the Justice Department told ABC News that department officials were taking the situation seriously and offering assistance to local law enforcement. "The Justice Department is taking the situation in North Dakota seriously, and has been in communications with state and local law enforcement officials, as well as tribal representatives and protesters, to facilitate communication, defuse tensions, support peaceful protests, and maintain public safety. The department has also offered technical assistance and community policing resources to local law enforcement in support of these goals," a DOJ spokesperson said in a statement. Authorities moved in to clear protesters from private land and dismantle a roadblock that closed down a state highway. Heavily armed law enforcement officials surrounded protesters and reportedly used pepper spray, tear gas and a sound cannon. 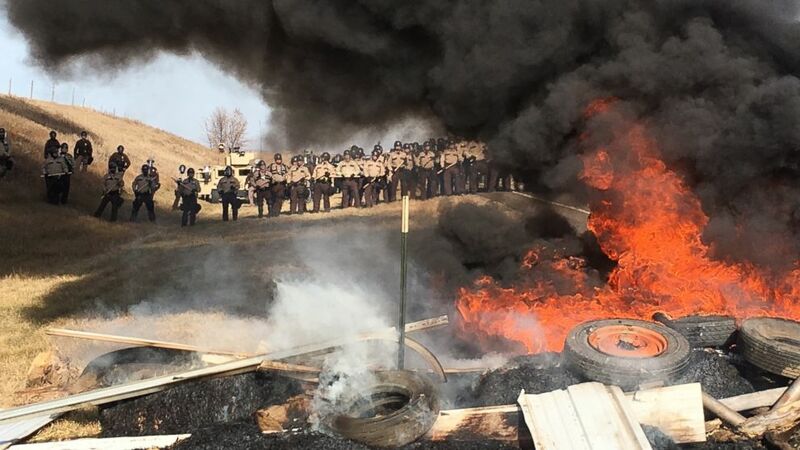 The Morton County Sheriff's Department announced that 141 protesters were arrested, bringing the number of those arrested since the protests began to more than 400. 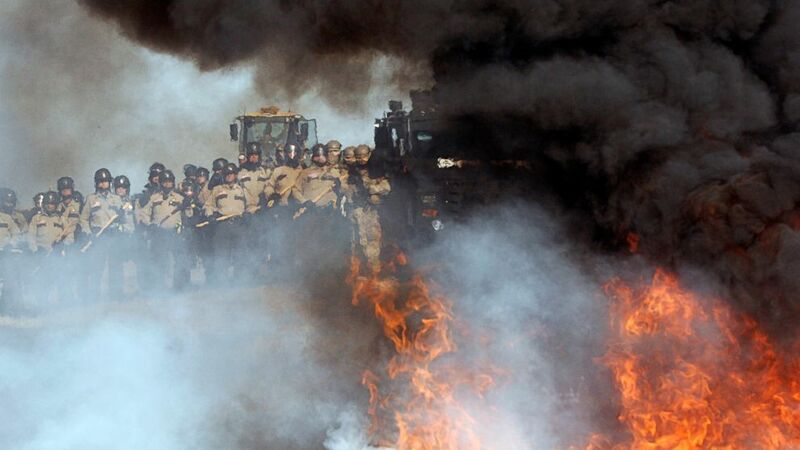 (Mike McCleary/The Bismark Tribune via AP) Tires burn as armed soldiers and law enforcement officers stand in formation on Oct. 27, 2016, to force Dakota Access pipeline protesters off private land where they had camped to block construction.